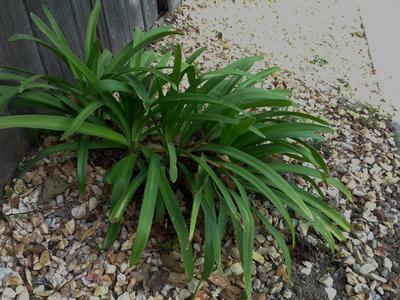 I have some plants around my yard that don't need much water and look fairly good. They also replicate fairly easily. The leaves have some thickness and ooze some sap when cut. 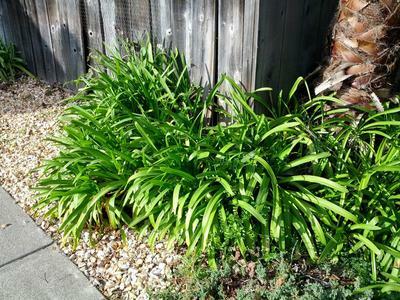 The plants are small and low-maintenance in Northern California. I'm very curious as to what it is. There are many possible culprits to this one; I suggest you dig one up and see what the roots look like. The type of flowers, if they are on single stems, or a cluster at the top of the stem. Color of the blooms and if they change over time, or open at different times as the flower stalk ages. The time of year that they flower. 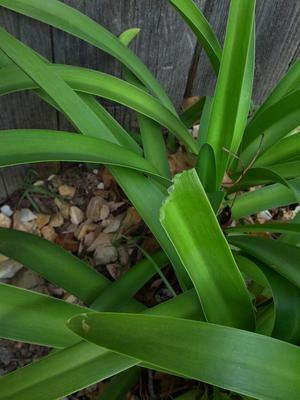 Some of the answers to these questions will help identify the plant. Sorry I don't know the answer instantly, it requires more detective work. I should have mentioned that the plant has blue flowers. A stalk rises out of the plant and a cluster of blue flowers arises at the tip. The roots are tubular and the plant can be pulled out of the ground without much effort. add "https://" to below to see the image. What you've got is Agapanthus - lucky! Thank You so much. I've wondered for years what they are. They look good. Need pretty much no water and the roots hold together soil well.